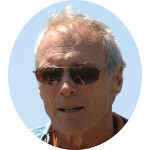 Clint Eastwood is an American actor and filmmaker. He initially rose to popularity on television in the late 1950s and early 1960s for his role on the Western series Rawhide where he played the role of Rowdy Yates in over 200 episodes. Towards the end of that series, his film breakthrough and rise to international stardom came from his portrayal of “The Man with No Name” in Sergio Leone’s spaghetti western trilogy that included A Fistful of Dollars (1964), For a Few Dollars More (1965), and The Good, the Bad and the Ugly (1966). The genre was referred to by American critics as Spaghetti Westerns due to most of them being produced and directed by Italians. In the 1970s and 1980s, Clint Eastwood would go on to portray inspector Harry Callahan in five Dirty Harry films. In total, his career has spanned over fifty years contributing to over fifty films as an actor, producer and director. Twice he as won Academy Awards as Best Director for films that went on to win Best Picture, Unforgiven and Million Dollar Baby. Clint Eastwood is a direct descendant of Mayflower passenger and Plymouth Colony Governor William Bradford. He is also a cousin to the notorious William Stoughton, Chief Judge and Prosecutor at the 1692 Salem Witch Trials. U. S. Presidential kin in Clint Eastwood’s family tree include Millard Fillmore, Franklin Pierce, Ulysses S. Grant, Rutherford B. Hayes, Grover Cleveland, William H. Taft, Warren G. Harding, Franklin D. Roosevelt, Gerald Ford and both Presidents Bush. He also has kinship to the current royal family through a connection with the late Princess Diana. Clint Eastwood’s kinship with fellow celebrities includes, but is not limited to, John Wayne, Walt Disney, Shirley Temple, James Spader, Humphrey Bogart, Katharine Hepburn, Hugh Hefner, Anne Baxter, Julia Child, Ethan Hawke, Richard Gere, Kyra Sedgwick, Ted Danson, and Marie Osmond. Other notable kin include American Revolution hero Nathan Hale, American Revolution traitor Benedict Arnold, Uncle Tom’s Cabin author Harriet Beecher Stowe, C.I.A. Director Allen Dulles, poet Henry Wadsworth Longfellow, inventor Thomas Edison, abolitionist John Brown, architect Frank Lloyd Wright, Prime Minister Sir Winston Churchill, aviation pioneers Wilbur and Orville Wright, and many others.